Clown and Bard, Praga, Czechy : Rezerwuj teraz! Our hostel has been on the map since 1995 and still just as young in spirit and focused on our guests' satisfaction as the day we started. With an international staff motivated by building new friendships and promoting a lively atmosphere, it is easy to consider this place a home away from home. We are located in Zizkov, which is just three tram stops from Vaclavske Namesti (the heart of Prague's center). 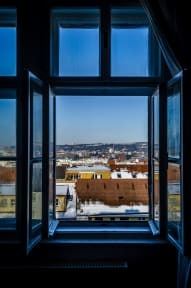 Zizkov is known for being the most socially diverse area of the city, making a short visit quite comfortable and in some cases worth extending. For those travelers on a budget yet still wanting to experience the culture of the local people, this spot is a gem. ZiZkov has the highest number of bars in the city and there are a variety of beer gardens, cafes and restaurants with both local and other ethnic cuisines to enjoy. 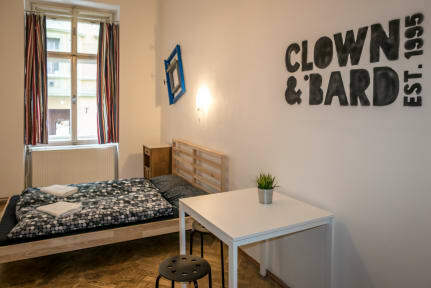 We thank you for your interest in Clown & Bard Hostel and look forward to meeting you! Zdjęcia pokoi przedstawione na stronie hostelu znacząco różniły sie od tego co zastaliśmy na miejscu. Pokój 14 osobowy wyglada jakby miał sie zaraz rozpaść, szafki sie rozlatuja, a łóżka są tak stare ze można sie obawiać ze zaraz sie rozlecą.